International Search is a very confusing thing for webmasters, SEOs, and business owners across the globe. I've worked with companies large and small on their international strategies and over time developed a set of questions that help identify the right strategy for any particular company. Those questions were made into a flowchart and an interactive tool for my presentations at SearchLove Boston and, most recently, San Diego. In this post, I wanted to share the flowchart, the tool, my presentation and the Q&A after my talk. My hope is that the confusion with online international expansion diminishes. This would perhaps lead to companies spending more time on creating the right content based on their target market and less on domains and HREFLANG. The original format was a flowchart (below) which was then put into a PDF. In the PDF, the "answers" are followed by tips for your specific strategy and resources to help implement that strategy. Basically the tool is the original flow chart, simplified. 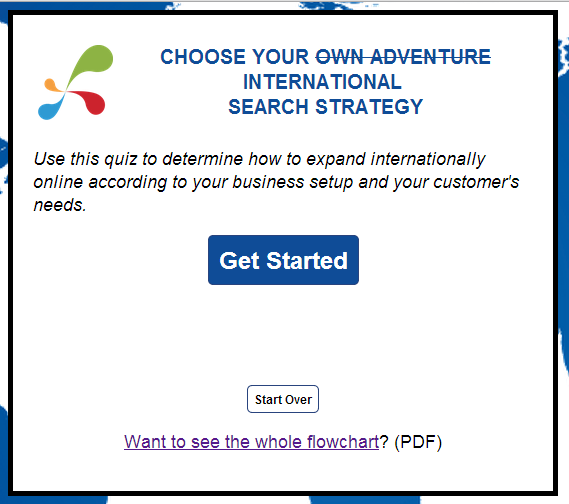 You click through a series of questions and the tool tells you what to do next in your international expansion. When to tool gives you the right strategy for your business, there are steps and tips to help smooth your implementation with links to resources. No more copying and pasting from the PDF. It's everything you need to get started. For those that want to see what my actual deck looked like, I am including it below. In presentation fashion, you can't really get everything I am saying, but you can get the general idea. (shameless plug coming ...) If you would like to see the whole presentation, or any of the others from Search Love San Diego, you can buy them soon from the Distilled Store. The main takeaways from this presentation were to use the tool, don't machine translate, and to test anything. I didn't actually cover testing anything in the presentation, but I think it's really important for everyone to do when changing their site or business. Never take my word, or anyone else's for that matter, always test things to see if they work with your business and market. Also, quick thank you to Shutterstock for the various world images I used in the presentation (and the tool). And to Dallas Tester, the brilliant man who coded the tool. Up next, I'll be speaking at the Marketing Festival in the Czech Republic and PubCon in Las Vegas. And finally, there were some great questions after my talk and I wanted to review them here. Question: If we are looking to expand but aren't sure about where to spend our budget, where do we start? Answer: It really depends on your business (use the tool! ), but translating is a good place to start if I had to give the fast answer. 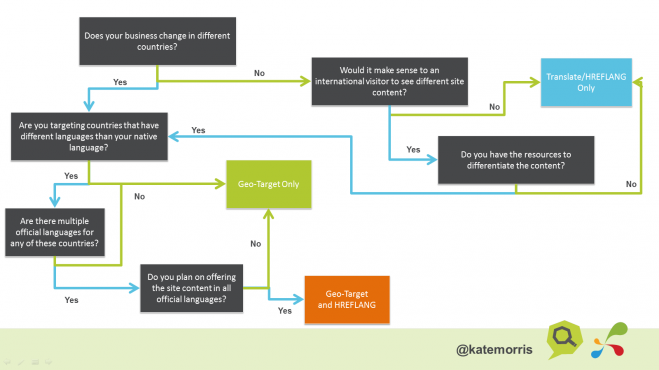 The real answer however is to use the tool and then start small from a geo-targeting or translation standpoint. Geo-targeting: If the tool tells you that you should geo-target or geo-target and translate, the easiest way to test the process is to pick a country that is very similar to yours in terms of Hofstede's Dimensions and language. Then develop for that one country. You can use any number of URL structures (ccTLDs, subdomains, or subfolders), but pick one and stick with it. Translating: If the tool tells you to translate only, then use analytics to tell you what is the second most popular language setting of your user's browsers and translate your site using that. Just start with one and see if and how your user's respond. In the same light, if you are US English and your next most popular language target is Spanish, look at your business model. If it's mainly US Spanish, use that dialect. You will probably start seeing traffic from Mexico as well. Now onto your questions. After looking at the tool, what is confusing? Do you have a specific situation that you'd like advice on? Let me know in the comments!